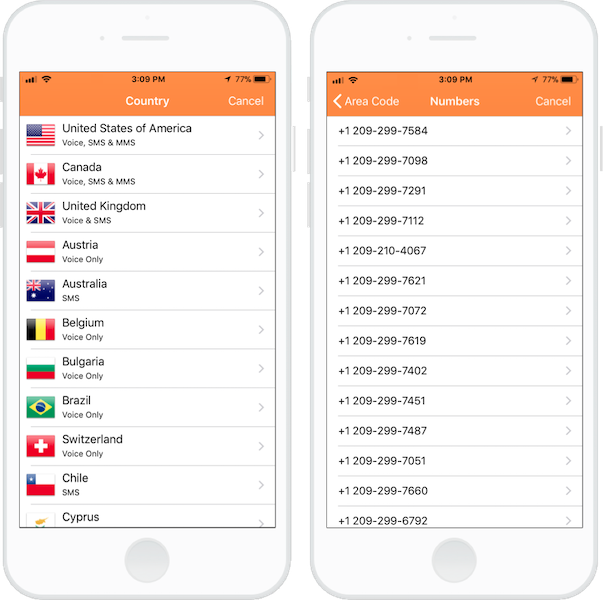 If you need to buy US phone numbers, Phoner - Second phone number app is an INCREDIBLE virtual phone number mobile app you that need to know about. If you are someone who needs to get a USA phone number online, Phoner has almost ANY number you can think of. Phoner features OVER 20,000 USA virtual mobile numbers, from every single state, area code, and county that you can think of. On top of that, Phoner also gives out FREE USA phone numbers! Don't believe us? Here is how you can buy get your free US number, or even create your own US phone virtual numbers in Phoner app. Phoner app gives you FREE US phone numbers! Why Phoner is incredible: It gives you a free US number instantly without you needing to buy one. In order to get and access your FREE US phone number, simply make sure that you have the 'Phoner number' selected as your current active number. Next, simply go to the texting screen or calling screen to send a text or make a phone call using credits. The 'Phoner number' is a randomized, anonymous US phone number. What that means is the number will appear differently for each person you call and text. To find out your phone number, just text or call someone to see the number that appears. If you think thats is really cool, that is not all. The 'Phoner number' is free to use and accessible by any user from all countries. No matter which part of the world you may be in, you can immediately use the Phoner number to text and call anyone. You can use it as a free US number to receive calls or SMS. Try it out and you will see what we mean! How do I download Phoner? Obviously, you will need the Phoner - Second phone number app, so go ahead and download it first. Did we mention that the link above was for iOS devices? Ok, if you were looking for Phoner app for Android, thankfully Phoner offers the same virtual phone number service for Android. Go ahead and download that if you are an Android user. What happens if I need a fixed US phone number that I can keep? The 'Phoner number' works as as a randomized number that changes each time. If you need a fixed, yet temporary US phone number to keep, you will need to choose a Premium US number for this. To pick a Premium US phone number, simply tap on Menu, followed by the option "Get Premium Number", and then choose USA as the intended country. You should now see a HUGE list of USA virtual numbers to choose from. Honestly, there are so many numbers that we find it pretty hard to settle on one. Awesome, right? How much do these US mobile numbers cost? You will not believe what I am going to tell you. Buying a Premium US mobile number in Phoner is one of the cheapest way to acquire or buy a new phone number in the USA for texting and calling. A new US telephone number costs less than $9.99 a month, with free Texts and Minutes for you to text and call. In comparison, a post-paid plan from AT&T will set you back by at least $50.00 a month for unlimited text and talk. Phoner may not offer unlimited text and talk just yet, but it is by far the cheapest virtual phone number app that we have tried. What do you mean by 'virtual' US mobile number? Virtual USA numbers may sound terribly scary, or sounds like it may not even work. However, virtual phone numbers simply mean that they work over the internet and not your phone plan. When you call and text using Phoner, none of the calling and text history from our virtual numbers will never appear on your phone bill. Can I buy US phone number to receive sms? Yes, phone numbers in Phoner app supports local domestic texting, as well as calling. You can text or dial any mobile, residential, or toll-free number and it will work just like a regular phone number. Can I talk and text other International phone numbers? Yes, phone numbers in Phoner app supports international calling and texting too. The low costs of calling and texting using Phoner makes it a great option for traveling or to call local phone numbers in other countries instead of using your own. Are these regular US mobile phone numbers? Yes, Phoner works with local carriers and telcos and the phone numbers are bought directly from the carriers on your behalf. Most calling and texting apps require you to start a subscription or to put a deposit before being able to call and text. Phoner however, provides the free 'Phoner number' that allows you to call and text for free immediately. This is a neat feature that you cannot find in other virtual number services. No matter whether you need an anonymous, randomized number, or a fixed US phone number, we feel there is no better way to buy US phone numbers than Phoner. Download Phoner - Second phone number app now to start texting and calling with your free number, or buy a US phone number within seconds!